Homeschooling parents, how many of these comments have you gotten? How many of these concerns are in the back of your head? 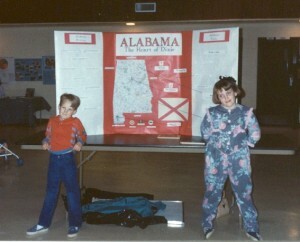 Kym and her brother presenting at a 1992 History and Science Fair. In 1989 I was five years old and enrolled in the local public school. It was still Summer—school hadn’t officially started—but we were at the school, meeting with my kindergarten teacher for open house. My parents were in their thirties and both had college degrees and jobs. My dad worked as a County Agent for the Extension Service, my mom was a freelance reporter for our local, small newspaper. I had a little brother, age 3, and he was a “spirited” child. We met with the teacher and I could feel the stress coming from my parents as we left. The teacher had been rude and condescending. She didn’t believe I could read or write and dismissed my parents concern about the school being K-12, and not in the best part of town. My parents were very uncomfortable with placing me in the hands of “that woman” for eight hours a day. But what other option did they have? Later than week, my mom would meet a woman who was homeschooling five of her seven children. A few days later my parents un-enrolled me from the local school and thus began my homeschool career. At that time, we were the ONLY family homeschooling in our county, and one of only a handful of families in the entire state. Of course, with such a radical decision, so came the comments. 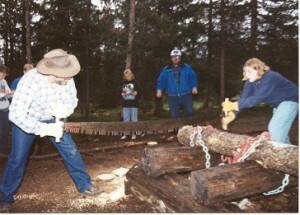 Kym and her father in a 1997 "Forestry Contest." The project involved taking soil samples, sawing logs, and taking core samples from trees and various other things a forestry department might do. We counted it as part of our science (biology) curriculum. My parents had several sleepless nights worrying about the same things. Being religious, they prayed for guidance and peace with their decision. And then they taught us. We were taught with textbooks; we were taught outside. We were taught at the library, in the kitchen, at church, and in the garden. We toured bizarre places like a museum dedicated to lentils, and a place in South Dakota made entirely out of corn husks. We were taught in co-op settings with other kids, or alone in a recliner with a book. I could have easily written this about any of the homeschool kids I grew up with or my brother. My homeschool friends are many things. Some of them are in the military, some of them have started their own business. They are teachers, mothers, fathers, scientists, preachers, doctors, dentists, lawyers, fiber artists, writers; anything they’ve wanted, they’ve achieved, but none of them are ruined. None of them are anti-social. Those who wanted to go to college, went. Those who preferred a different route took that one. Our parents all had different methods for homeschooling. Some took a more rigorous approach, some were very laid-back, some were a mix of the two, and then some other random methods were thrown into the mix. But we all had one thing in common: our parents made an effort to make sure we were presented with different view points, different experiences, and plenty of time to learn and explore on our own as well as to be guided. Most importantly, our parents loved us and accepted us, our learning styles, and our personalities. The decision to homeschool is a big one. It’s not right for every family, but as long as parents take steps to encourage and support their children, homeschooling will not ruin them. It won’t make them anti-social. If they choose to go on to college, they’ll be just fine. Parents, don’t let the negative thoughts creep in and make you second-guess yourself. Your children are going to grow up happy, loved, and educated in life. I’m 27 years old now. I’m a mom, a wife, a doula, a blogger. I have a college degree and thoughts of continuing my education with a masters degree. Homeschooling didn’t ruin me. Kym is a 27 year old God-loving SAHM to a two-year-old boy, a patriotic military wife, and a doula in training living deep in the heart of Texas. She graduated from college with a degree in History Education/Religious Studies and three weeks later gave birth to her wonderful son. Her passions lie in homemaking, natural birth, breastfeeding, gentle/natural parenting, cloth diapers, co-sleeping, and living a healthy lifestyle. When she’s not chasing her toddler (or being chased by him), she blogs about life at Our Crazy Corner of the World. I think home schooling (Online Interactive Studies) would be good for education, for lowering the physical stress and for saving times. But children should be engaged in social activities as well. They should not be kept in home all day. 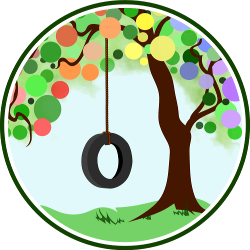 Outdoor activities like playing games, meeting with other children are also necessary. The most important education they will receive from their parents that will make them a good person first. I wasn’t ruined by homeschooling, either! Neither was my husband, my best friend, or any of several other homeschooled friends I have. We have an advantage our parents didn’t: we are seeing the first homeschooled generation grow up and do fine. My mom didn’t know a single homeschooled adult when she decided to try it with us. Luckily, it worked great, and I have total confidence about homeschooling my son when it’s time. I’m a homeschooling Mum and while I don’t feel or worry that I’m ruining my children, I’m worried it’s ruining me and my marriage. I just hate it, but my husband thinks it’s great. It’s created constant conflict and I wake up everyday dreading what my life has become because of homeschooling.